thursday last week had us boarding another flight. this time to visit the causeway coast in county antrim, northern ireland. the whole area is stunning, with quiet roads, beautiful scenery and history that far surpasses anything we can find back home in new zealand. we stayed in a beautiful quiet country location not far from the giants causeway, choosing to spend the afternoon of our first day taking a tour of the local whiskey distillery in bushmills. because of the high volatility in the areas we toured through, photos were not permitted, but the tastings at the end more than made up for it! and checked out the waterfalls in the glenariff forest park. the holy wells were founded in the 7th century by st. cooey. according to tradition, it was here that he performed his pentiential exercises in the late 7th and 8th centuries. the foundations of a church, modern altar and three holy wells may be found. a drinking well, washing well and eye well are still visited by pilgrims and are reputed to have healing powers. tomorrow we’re up early to head to belfast international airport, headed back to london. but for right now, i’m off to enjoy another pint of the local brew. cheers! This entry was posted in travel, uk and tagged northern ireland. Bookmark the permalink. Someday I will see more of the North, but brief previous trips, years ago when things were very politically upset, were not too relaxing.Someday, I will give it another try. Thank you for sharing your journeys!! I’ve just taken a mini holiday – we had such a busy day yesterday helping customers get what they needed – it was ‘headspinningly busy’ so it’s been nicely calming to stop and look at your beautifully crafted pictures and have you take me on a trip to ireland, prague(what a beautiful city, makes me want to go there) and other places… Lately I’ve taken to buying BEAUTIFUL books with a recipe or two inside(not the important thing to me but makes it interesting) and pictures of places with stories to read when I want to travel by mind … these pictures would all qualify and i’m sure you are equally qualified to write an interesting story to go with them – add to that some beautiful paper and beautiful print finishing and you’ll have a long time customer from me with a library of your books!!! beautiful! *sigh* I love ‘traveling’ with you. where did you say you are? those trees! puffin! bridge! everything! Fantastic photos! I felt the same about the history in the UK – but New Zealand is only short on history if we restrict it to human history – funny how we do that, isn’t it? Oh how wonderful! Loooove those beech trees & what a cool picture you set up for the windmill. Wonderful to see more of your adventures! Safe travels home. mwah, love the puffin! so cute……. I would definitely need a LOT of Guinness before attempting that rope bridge – which is probably not advisable! These photos are fab – NI looks like a great getaway. Awwww… I wanna go…. 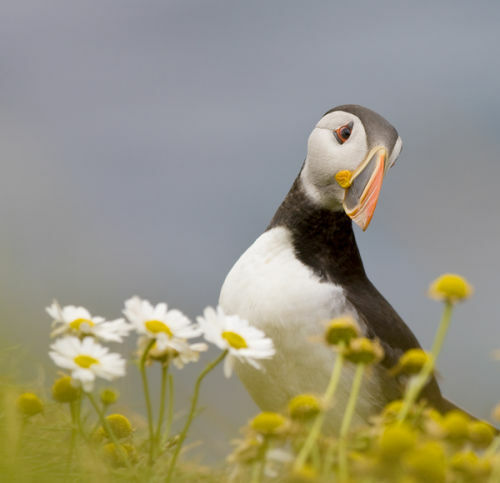 All shots are gorgeous, but love, love the puffin. It sounds like you felt at home there ~ there’s a sense of easy peacefulness in your words and photos. Lovely photographs! Those beech trees are amazing. Wow, I really want to go visit Ireland now.